If we know one thing after our many decades in this business, it’s that rafting is a superb group activity. For Scout Troops, Church & Youth Groups, and other non-profit organizations, rafting brings people together in a spirit of teamwork and fun. And, it gets everyone outside in the sunshine experiencing the natural world. Like the Girl and Boy Scouts of America, we believe that outdoor activity, teamwork, and fun help build character and community. And rafting, with its inherent emphasis on working together—while having a blast—does just that. We can even help your Scout Group with the Whitewater Merit Badge fulfillment. What better way to get kids connected with themselves and their peers than through an outdoor activity that requires team-building and gets a big smile on everyone’s face? 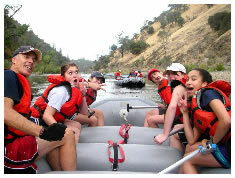 We have years of experience helping young people come together, learn, and grow, on youth group rafting trips. Women’s and men’s retreats, study groups and church youth outings - rafting brings people together, helping them grow as individuals and as a community. Whether your goal is experiencing fellowship, appreciating nature, or creating space for family connection and individual reflection, a rafting trip is the perfect framework for a church group activity. Why choose All-Outdoors for your trip? We’ve been in the whitewater rafting business for over 50 years - and we’ve learned a thing or two along the way about having fun, running professional group rafting trips, and maintaining the very highest safety standards. We love what we do and we love sharing our rivers! "I have often told people that there is no safer or better company on the river. Now I SHOUT it to all I meet…we all agree that there is no one better to trust our Stanbridge kids to." "I would have to say without reservation that All-Outdoors is one of, if not the best river company I have ever seen or worked with." "All-Outdoors did it again!!! You all created an incredible experience for our dads and daughters! They had such a great time. Thanks for being so great to work with!" Select our exclusive Private Charter Trip Rates that save you 24-28% on the popular South Fork American and Middle Fork American rafting trips. Take advantage of our Group Discount that starts at just 6 people. This discount applies on any river, any time. Save up to 25% by booking during one of our annual Seasonal Promotions. We understand that planning a group outing can be overwhelming. Call us at (800) 247-2387 and we’ll guide you through the whole planning and booking process, explain all discount options, and be there for you from your first call to the actual trip and beyond!